bits and pieces on Brighton and thee beyond…..
18.04.2010 Destination 100, St. James Street BN2 1TP. Having puffed ourselves out cheering on the runners at this year’s Brighton marathon we are in dire need of some fried food fortification. It’s a beautiful spring day and too nice to sit inside so we head to St. James street to try out a garden cafe we’ve had our eye on for a while. 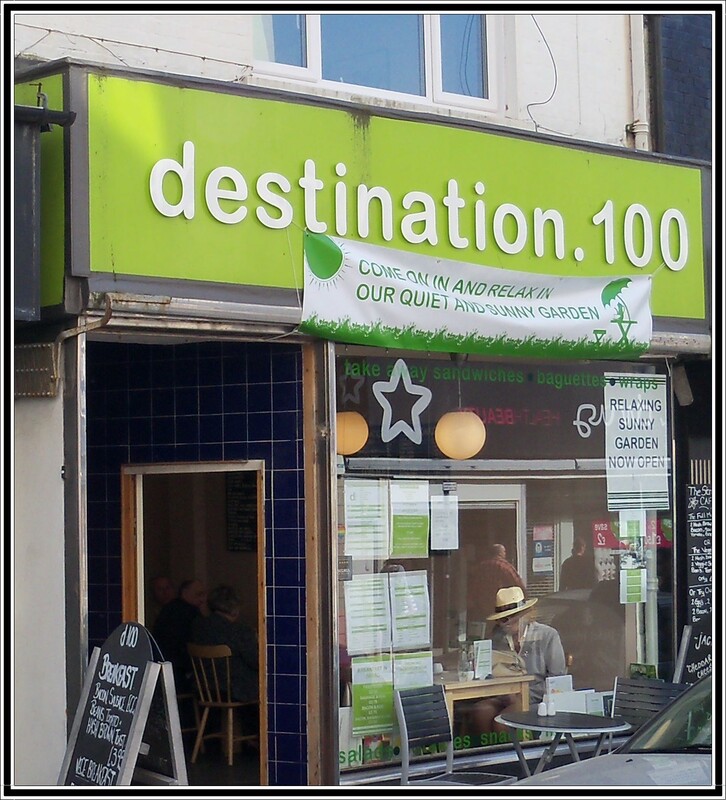 Destination 100 sits right next door to another one of our favourite eateries The Street. Since Destination also boasts an outside garden, today seemed the perfect chance to try out their breakfast. Inside, the cafe is cool, clean and uncluttered with a large sandwich counter showing off an array of mouth watering goodies. Specials on offer include Cottage Pie and Lasagne, both with salad and chips for £3.95. There is also big selection of sandwiches and baguettes on offer as well as the usual range of lunchtime toasties, pizza slices and jacket potatoes. We place our order and head into the garden. I’m having the veggie and D the Full English, both come with toast and cost £3.95. The paved seating area outside is lovely; it’s clean and modern with plenty of sun and potted palms and not a wibbly wobbly table in sight. Tea and coffee is served in elegant white china embellished with the Cafe’s logo. Service is very friendly and courteous with the staff going out of their way to check we have everything we need to enjoy our food. The breakfasts are both tasty, well presented and served nice and warm on big china plates. The portions are very generous and I particularly enjoyed the home cooked flavour to the mushrooms. The eggs were very nicely done with no burnt edges in sight. This was a nice, relaxing breakfast with the peaceful outside garden making us feel a millon miles away from the bustling traffic and busy marathon crowds. 02/06/2010 Time Out Cafe, 3-4 East street, BN1 1HP. Another breakfast close to the sea, though this time at the Palace Pier end of the promenade. 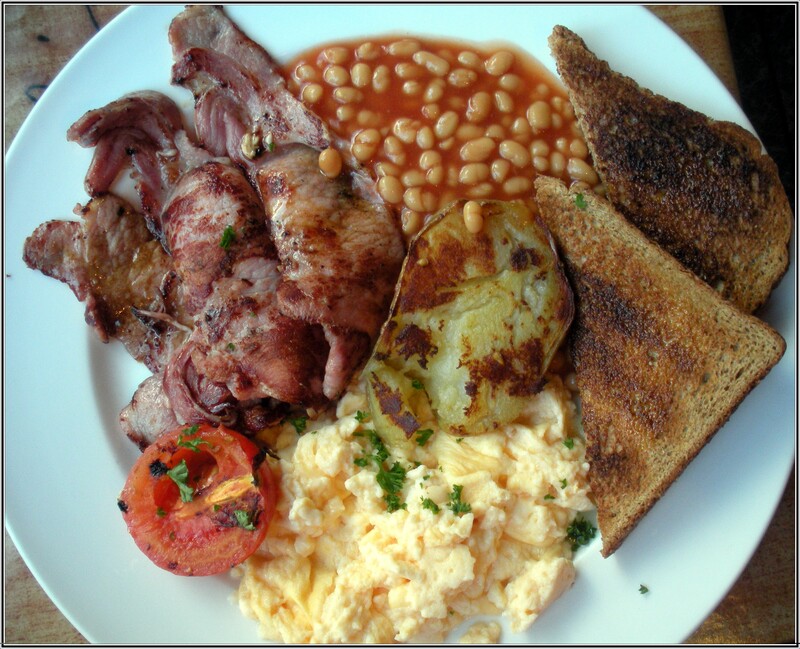 Time Out is a fully licensed Cafe/Restaurant specialising in English breakfasts. There is space for eating outside but it is too cold and windy for that so we opt for a nice table by the window indoors. East Street is a busy place for shopping and can get quite crowded on Saturday afternoons but there is a nice relaxed feel to this cafe. Inside is softly lit and painted in muted orange and blue, with faded prints and large spider plants lining the walls. Specials of the day include Fresh Mackerel or Sardines griddled in oil and seasalt and served with fresh veg and potatoes and salad for £6.95 or Broccoli and Stilton soup served with croutons and garlic bread for £3.95. There are also a range of homemade cakes, sandwiches, pastas, pizzas and other luncheon treats on offer as well as an evening menu that starts at 6pm. We of course stick to breakfast. This time D decides on the Vegetarian, unable to resist the promise of a giant yorkshire pud, and I opt for the 100% Healthy Option, complete with grilled bacon, potato and scrambled eggs. Both breakfasts come with drinks and toast. The coffee is hot, strong and filtered and service is good. As you can see from the photo’s, breakfast was a treat – and tasted as good as it looked, brimming with lovely home cooked flavours and textures. 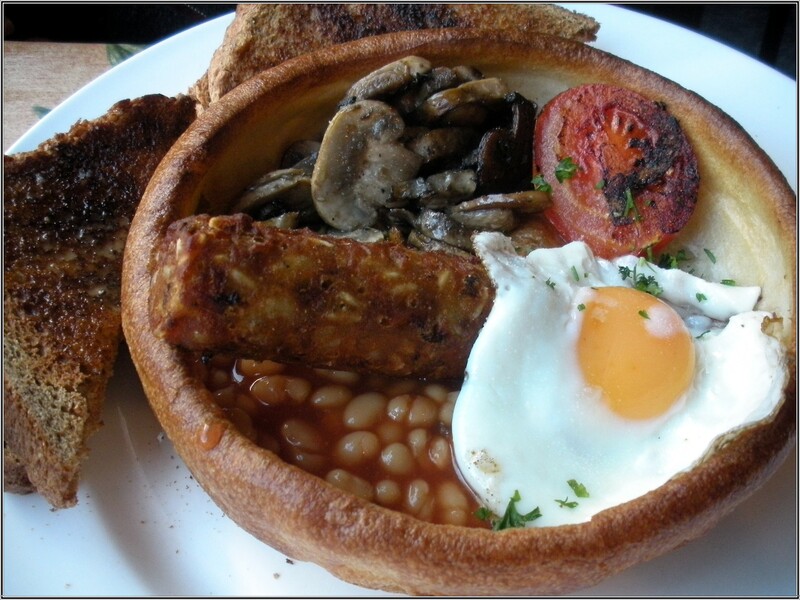 Extra nooky points awarded for the fantastically presented vegetarian – a cornucopia of goodness nestled in the most yummy giant yorkshire pudding we have ever had the pleasure of eating this far south of the border. 30/01/2010 West Beach Rock Cafe, 135 Kings Road, BN1 2HX. The West Beach is a great place for a fry up with a view. This south facing cafe is just one big window that lets in all of the sun but none of the blustery sea air, so you can sit and bask in the sunshine while enjoying views over the West Pier. 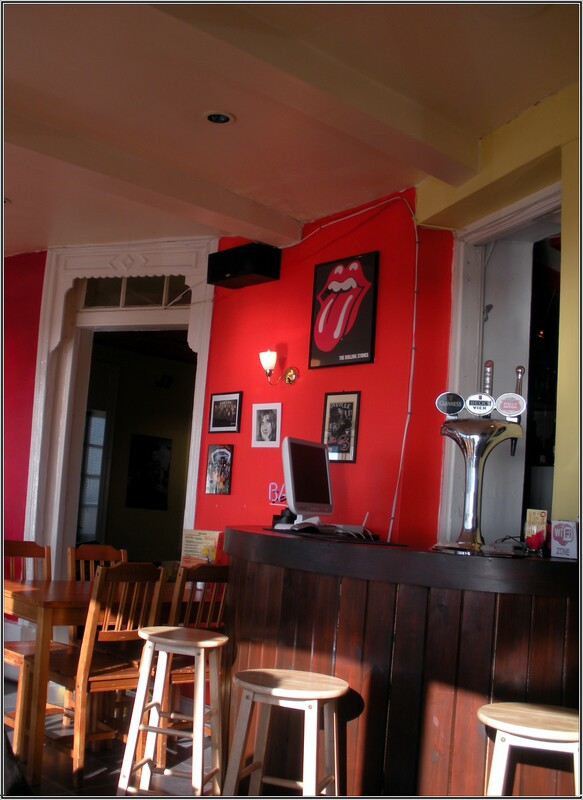 Inside is crispy clean and brightly decorated in yellows and reds with various pictures of rock gods adorning the walls. There’s a flat screen telly (channel 4 + 1 with the sound down) for those who prefer soaps to seaside, and the chunky pine tables and chairs are comfy and homely. To the left is a bar and a games room with more seating, big sofa’s and a pool table. Wi-fi is also available. Background music is a selection of modern pop (Dido, Kylie, Rhiannon etc) which is a little disappointing as from the name we would have expected something a little more, well, rock. The menu is a mix of lunchtime grills, main courses, salads and snacks, with a range of breakfasts on offer including French (with crepes) and Spanish (potatoes and omelette). There is also the All Day Special for £5.90 with drinks included. I opt for the Veggie and D the Meaty All-Dayer. Service is very good, despite the place being busy. Tea and coffee arrive first in big white mugs. The coffee is hot and strong so I’m happy – and the tea looked good too. And the food? Well this is our first fry up of 2010 so expectations are high. Luckily the West Beach doesn’t disappoint and breakfast is a treat. Everything tastes fresh and flavourful and is served piping hot. Bacon was crispy and home cooked tasting and D was especially pleased with his three sausages. As for the veggie – what can I say? The omlettes here are the best in Brighton I reckon – chunky and cheesy with just enough gooiness and none of the stodge. 19/10/2009 The Buccaneer, 186 Kings Road Arches. Arrrh shiver me timbers, there is nothing quite like an alfresco, out of season fry up right on the sea front to really make a breakfast special – with the wind whistling through your hair and the tang of seasalt flavouring the air around you; not to mention the odd maurauding seagull or two. Braving the elements one brisk wintry morning, we decide to eat at The Buccaneer, one of the many cafes nestled in the Kings Arches along the seafront. Menus are on the tables and you order at the counter. Coffee soon arrives and is piping hot, providing a welcome releif from the brisk breeze that is beginning to blow in from the sea. Breakfast arrives soon after and I pleased to say it’s heated up nice and hot and served on warmed up plates. Both platters are attractively laid out with a delicious home cooked flavour to them. Eggs are served over easy and the beans were especially high quality – it was nice to have beans that were full of them (beans that is) instead of just a few swimming inside a pool of runny tomato sauce. Service was especially attentive, this seems to be a family run cafe and the waitress regularly came by to ask if everything was ok. 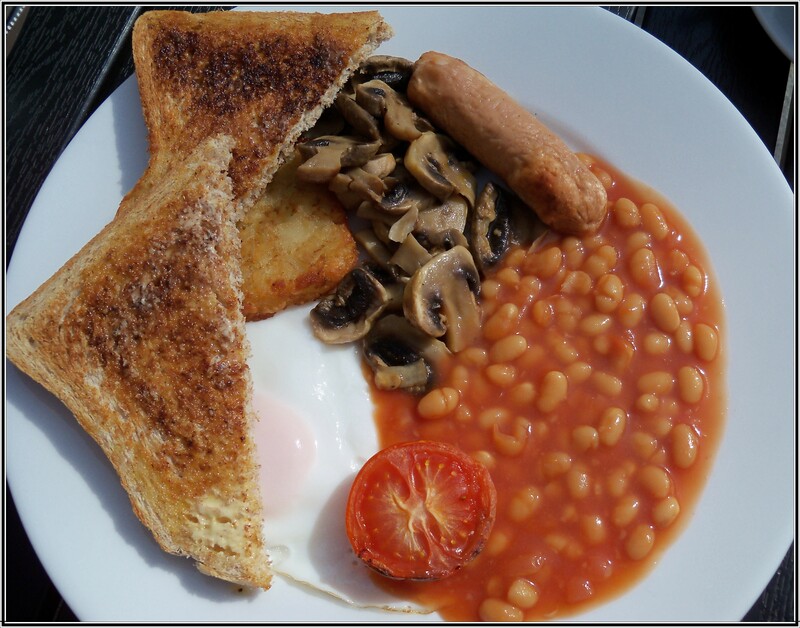 Both breakfasts with drinks came to £10.95, not a bad price at all for Brighton and all the lovely fresh air made our fry ups seem especially healthy! 05/09/2009 The Dumb Waiter, 28 Sydney St, BN1 4EP. The Dumb Waiter is a regular of ours when we’re in the Laines. There are a wide range of reasonably priced breakfasts on offer with lots of extras giving you the opportunity to mix and match a tailor made fry up to suit any particular tastes, including plenty of vegan options too. The colourful decor outside extends inwards, with brightly stenciled walls covered in posters and local artwork creating an arty, community feel perfect for ths side of town. 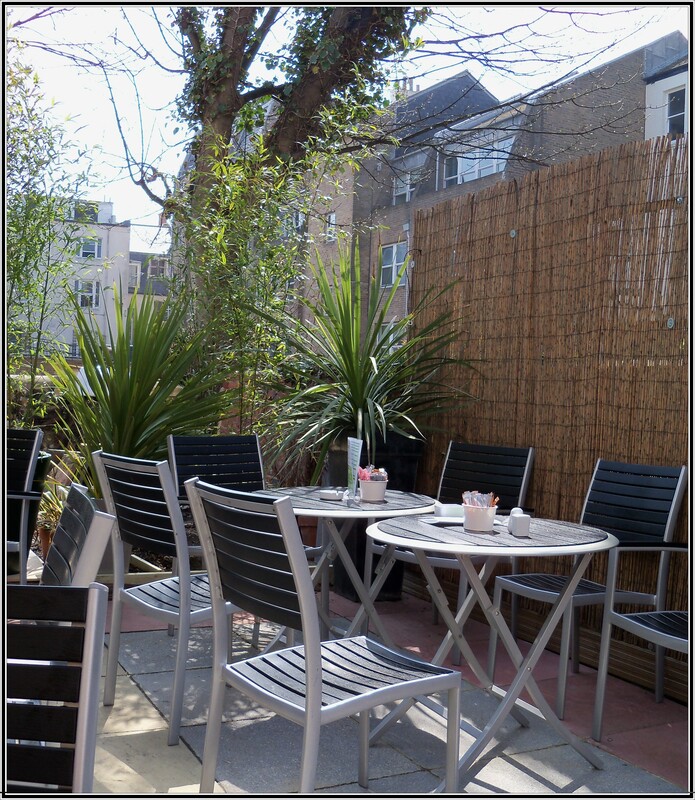 There is also the choice of eating outside in the garden or in front of house. We choose to eat upstairs today, which is a nice and quiet area with a lovely big window giving us a great view of all the frenetic shopping going on down below. You order breakfast at the counter from a large chalkboard menu on the wall. I chose a veggie with coffee and D the meaty with tea. There is nothing negative to say about the service, which is fast and friendly, though they rather foolishly waylaid D on his way back from the toilets and entrusted him with carrying the drinks to our table; inevitably resulting in a rather deadly trail of tea and coffee snaking its way up the stairs. Breakfast is delicious. The meaty comes with mushrooms and chunky golden potato wedges. The egg looks a treat, cooked sunny side up on a fried slice. The sausages are flavourful and overall D voted this breakfast one of the best so far. Portions for both breakfasts are generous though I was wishing I had paid more attention to the menu and ordered an egg with mine – but technically speaking I suppose eggs aren’t really vegetarian. My bubble and squeak was a chunky, tasty addition and the veggie sausages are nice and spicy tasting. Toilets are ok with plenty of reading material on the door to keep you occupied. Both breakfasts, complete with drinks, come to £12.60 which is fairly good value round these parts. We really like this place – it’s a friendly, relaxed place to enjoy a yummy breakfast with plenty of choice on offer. 31.08.2009 Cafe Motu 6 Trafalgar Street, BN1 4EQ. We’ve been piling on the Bank Holiday pounds with yet another fried breakfast over the BH weekend. This time we’re a bit closer to home, just south of the Laines on Trafalgar St. This is our first time eating here, as every time we pass this place it is always busy, so we decided to make use of a quiet Bank Holiday afternoon to find out why Cafe Motu is so popular. First impressions are good. Chunky wood tables and chairs – in fact, chunky wood everything – blends nicely with the old style beamed, mustardy yellow walls to give the place a homely, traditional ‘caff’ feel. There’s a bright bay window letting in loads of light where you can choose to eat if you like watching the world go by, and plenty of papers, posters and pics on the wall to look at for those with butterfly-brained attention spans. Ye olde style toilets are downstairs, hidden by an undersea mural and cunning use of mirrors. The menu’s written up on the wall and there’s a variety of food available, including a range of tasty sounding credit crunch lunches, all priced at £3. Another tasty treat was the fish finger sandwich at £2.50, which I was sorely tempted by, but duty called so I stuck with breakfast. Cafe Motu have six different breakfasts on offer, including omelettes, scrambled eggs and an American Breakfast with pancakes. 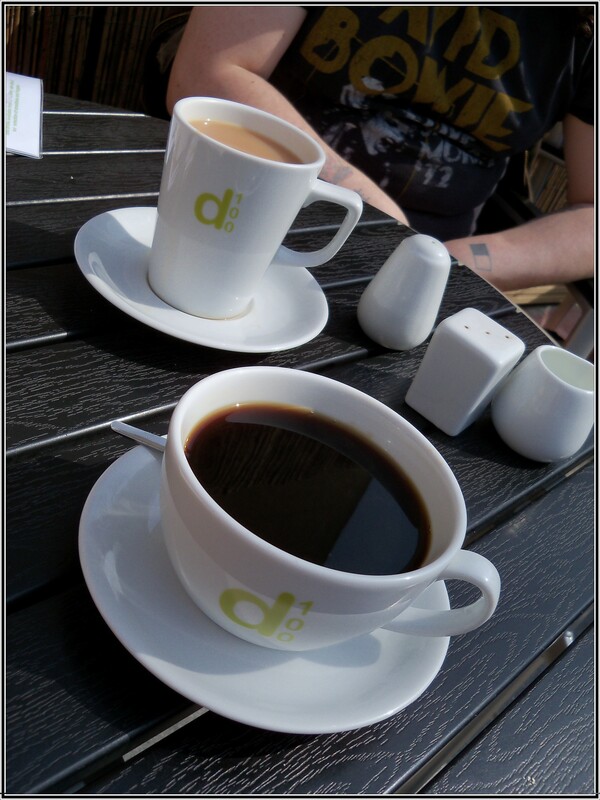 Surprise, surprise – I ordered the Vegetarian with coffee and D had the Meaty fry up with tea. Service is fast and friendly. Coffee and tea were served strong and hot in bright coloured mugs and our food arrived soon after. The veggie sausages are particularly nice and the bacon was cooked perfect wth just the right amount of crispy bits. Though I had a slice of toast with the veggie, we were also given a plate of toast on the side. The meaty portions were generous but I would have liked some beans or mushrooms with mine – though these can be ordered extra and D had enough beans for the both of us. Both breakfasts, with drinks and toast came to £11.60 making this a very good value breakfast for this side of town and it’s no surprise why Cafe Motu is popular. I for one will definitely be popping in for a fish finger sandwich soon. Since the untimely demise of my fave vegan cafe on North St last year, I have been on the look out for a soyatastic breakfast replacement, so it was with some sense of anticipation I made the (very long) trek down to Hove Lagoon to check out Heather Mills’ new venture and whether it lived up to the hype. Situated right near the sea front in the middle of not very much at all, flanked by a skate park and paddling pool, this looks a prime location to cash in on on hungry families out for the day and it certainly was very busy by the time we arrived. Inside is bustling. There was nowhere to sit by the bar or in the small front seating area so we moved to the back where we were able to perch ourselves around the sushi style counter, apon which an endless procession of not so yummy looking cup cakes and flapjacks rotated throughout our meal. There is also additional seating outside but today was not a day for alfresco dining. However the doors to the front and back were in constant use by staff and punters alike so we might well have been outside as the wind rattled across the cafe through my poor beleaguered bones- it was freezing! Despite our best efforts to brave the long cold trek across Hove we were too tardy for a fry up, since Breakfast is only served till 11.30am, so we ordered burgers instead. I had the Soya Cheese and bacon burger and D the Soya Nacho burger, complete with taco chips and guacomole. We also get a side order of fries to share with a ginger ale and Vanilla soya shake to drink. There’s lots of other veggie treats on offer and to look at the rest of the menu click here. Service was excellent – the staff are all very friendly and, despite the place being incredibly busy, we did not have to wait too long for our food. Food wise however the reviews are mixed – D loved his taco guacomole whereas my burger didn’t taste of anything much and felt kind of dry. I tarted it up with some of the condiments on offer and though the vegan mustard was delicious the mayonnaise tasted of nothing at all and had the consistency of seagull poo (but well done to anyone attempting to make vegan mayonnaise). The fries were ok – again D found them delicious but to me they weren’t hot enough and tasted a bit like oven chips. The food’s not cheap either – our meal comes to £17.50 for two burgers, one portion of fries and a couple of drinks and for that price I would expect a little more restaurant and a little less cheap n chilly seaside cafe. So overall our opinions are mixed – while it’s great to have someone brave enough to open an all vegan eaterie I just don’t think the venue is quite up to the price and the food could be a little more flavourful. 15.08.2009 The Street, St James St, Brighton. Located about half way up – or down? 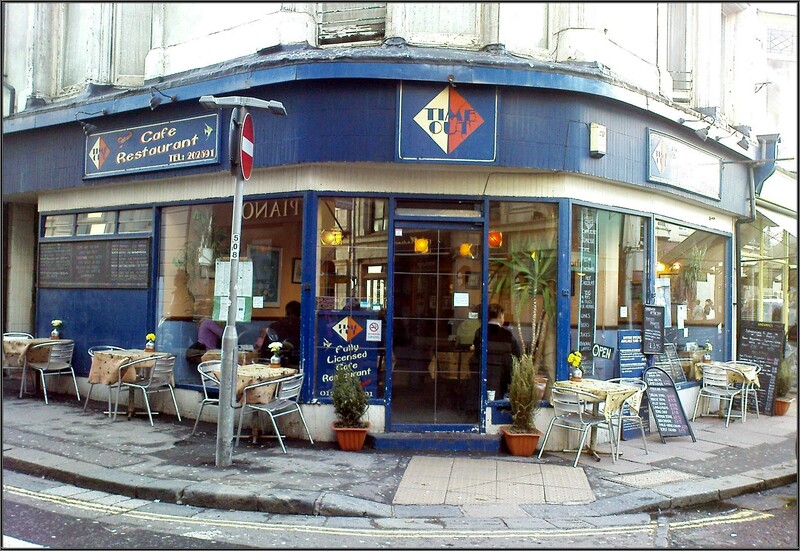 – St James Street in Kemptown, The Street is a perennial favourite of ours due to a lovely outside garden eating space which makes a leisurely weekend fry up such a pleasure on a nice sunny day. Today was not so sunny so we opted to eat in instead. The cafe itself is spacious and bright with sparkly lights and glowing pink painted woodwork contrasting nicely with the bare stone walls and monochrome prints. The menu is standard Cafe fare, with toasted sandwiches and baguettes vying for your attention alongside jacket potatoes and pasta. Specials of the day included Homemade Soup with crusty bread and Garlic or Lemon Chicken Roast with chips and coleslaw. We of course order breakfast, I have the Veggie Monty with extra mushrooms and Dan the Full Meaty Version with extra black pudding. Feeling especially peckish we also opt for a sneaky bowl of chips on the side. Both breakfasts cost £4.25 with mushrooms and blackpudding an additional 85p. Drinks are extra and we both order coffee. The coffee is delicious – piping hot, filtered and served in big round white china. Condiments on offer were the standard ketchup, mustard and brown sauce. Despite it being a busy Saturday lunchtime, the food arrives quick so we tuck in. Eggs were served sunny side up and crispy round the edges and had just the right amount of gooeyness. I liked the veggie sausages and the hash browns were nice and crispy. My tomato, well half tomato, must have been the smallest I have ever been served but though it was small it tasted just fine. Dan liked the meaty stuff but was eyeing my extra egg and sausages with envy. We had to wait a little extra for the chips but they were worth it. Served up piping hot and cooked just perfect they were like a deliciously sumptous too hot bath that you know can’t be good for you but you can’t help wallowing in just the same. 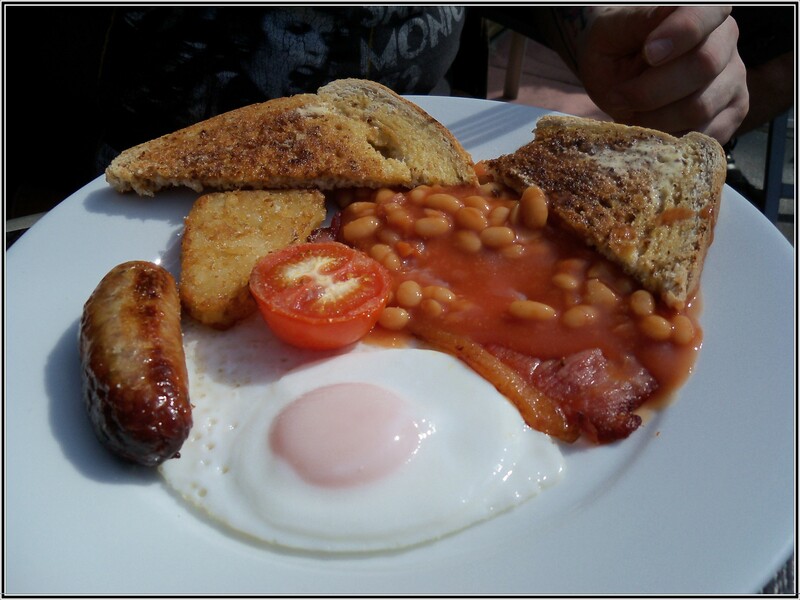 Service was very friendly and attentive and overall this was a tasty, good quality fry up – just beware the hole in the toilets. 20.07.2009 Kensington Cafe, Kensington Gardens, North Laine, Brighton. Situated smack bang in the Laines and enjoying it’s own special outside balcony space to boot, this gem of a cafe is a prime spot for people watching and is always bustling. We thought it’d be a good idea to test drive Kensington’s fry ups during a weekday so, making good use of a quiet monday morning off work, we make our way to the Laines where, behind a tiny doorway up a brightly coloured flight of stairs, we ascend into the cafe proper. Inside is cosy with brightly coloured walls contrasting nicely with the bare wood floors giving the cafe a homely, bohemian feel. There’s a nice balcony outside where you can eat and watch all the frenetic shopping going on in the Laines below, but we were happy making use of the muted lighting and comfy big wooden booths indoors. Music was an eclectic mix of the mellow, Sinatra / REM , to the not so mellow but nookytastic Placebo and QOTSA. Staff are very welcoming and friendly and there is a nice laid back feel to the place. Well what about the grub? Having worked up an appetite from walking up the stairs we decide to order the Big breakfasts – I order the big Veggie and Dan the Big Meaty. Both are £5.15 with toast and tea or coffee included – making them excellent value. There are smaller breakfasts on offer at £3.95 and a vegan option, as well as the usual assortment of salads, jacket potatoes, chip n dips and burgers. Breakfast is soon served so we tuck in. I opted for scrambled eggs this time and they were deliciously light, fluffy and eggy tasting. The veggie bacon was also a welcome addition. Coffee was filtered hot and strong and served in a big mug. D particularly liked the sausages and said his fried eggs were cooked perfect with just the right amount of gooeyness. The only quibble is that we both thought the food could have been served a little hotter. All in all a really good value fry up in the heart of Brighton’s best shopping district and a fun place to eat, relax and watch the world go by. 06.06.2009 Lanes Patisserie and Cafe, Ship street, Brighton. Every time I walk past this place I’m reminded of the sweety house in Hanzel and Gretel and this pink palace near Ship Street certainly looks good enough to eat. So what about the inside? Downstairs there’s a range of delicious looking cakes and treats to tempt passers by and a takeaway service providing all the usual lunch time essentials – the sandwiches are very good value and the cheese coleslaw baguette is a regular favourite of mine. The eating area upstairs is fairly small and decorated in a bright minimilist style with a dark tiled floor blending nicely with the cream and light olive green walls and the bay fronted window providing lots of light. Big mirrors and stained glass windows provide added points of interest. Not so great were the wooden flowers on our table which loked a bit sad to me but sad looking flowers were certainly not going to dampen our appetite. As usual, I ordered the Veggie breakfast and Dan had the Full English. Other lunch specials on offer were the Steak pastie and Pepper sauce for £2.95 and Ravioli at £3.95. The Veggie breakfast cost £4.15 and the Full English £5.15. Drinks were extra. There was no background music so breakfast was a little muted but though it was busy, this being a Saturday, there was a pleasant relaxed feel to the place and service was friendly and brisk. Both breakfasts were very good with a home cooked flavour to them. The bacon was cooked nice and crispy round the edges and it was nice having two slices of toast with each breakfast. I would have preferred less beans with the veggie and maybe some mushrooms or hash browns to add variety but I did get three sausages which were very tasty. Coffee was served piping hot and strong and tasted delicious. The toilets, which are situated on the floor above at the top of what must be the narrowest stairs in Brighton, are clean and bright and get extra nooky bonus points for having the most delightful smelling anti bacterial handwash in the world.